Home Dog News Do Your Kids Know How to be Around Dogs? Do Your Kids Know How to be Around Dogs? Dogs are a big part of our lives, and if you're a parent with one or more children, you know that dogs are a huge part of their lives. But do your kids know how to be around dogs? Not to scare you, but a quick internet search will bring up plenty of news items about dogs attacking children. They are happening all the time. I went through just 4 pages of the Google search results and – unfortunately – almost all the attacks were by Pit Bulls. There was also a Malamute and a Police dog, most likely a German Shepherd K9. For a small amount of balance, one of the attacks was by three dogs. They were said to be a large black Poodle, a smaller, white fluffy dog and a small black dog with white patches! Also 2 black Briard dogs carried out one attack. I had expected the dogs involved to include Pit Bulls but was really surprised that the vast majority were Pit Bulls. It isn't a huge sample of course. In almost all the cases the dog was loose. One case saw the dog chained in a garage and the child went into the garage. In most of the reports there is no information on what triggered the attack. In one of the cases the owner claimed the boys kicked the dog. If someone kicked my dog they would be in more danger of being bitten by me than the dog. The number of Pit Bulls off leash brings up other issues about responsible dog ownership. A bad tempered Pit Bull is almost always caused by a bad owner. We still have too many of these type of dogs being owned as a status symbol or even as a weapon. Certain pet parents get them for very wrong reasons, thereby giving the breed a bad name, but that's a topic for another day. And especially dogs they don't know. As a child I was terrified of dogs. Not just scared. Terrified. I don't remember ever being bitten. I have no scars. I had a few dogs approach me who were barking and snarling but they never touched me. My parents did try to help me. I think I was about 2 years old and they bought me a Labrador pup. Bearing in mind I was 2, the way I remember it is that I was left in the living room with the puppy. I remember being chased round the coffee table by him as I screamed my head off. The puppy was gone the next day. My friend, John and I used to ride our bikes past a house that had a small terrier type dog. We were about 10 years old. The dog would hear us coming and charge out of its yard to chase us. Occasionally, he would get near enough to nip at our shoes. John thought it was great fun (his family had a dog). It scared the living daylights out of me but I was too stubborn to admit to him that I didn't want to ride that route any more. I was fine with dogs that I knew. There were neighbourhood dogs that I got to know. They weren't a problem. My sister had a dog when she moved out of home. I used to wrestle with Oscar, the Retriever. As I grew up I managed my fear by avoiding dogs that I didn't know. Most of the time it worked. I didn't really understand the fear until later. Around the age of 30, my wife and I were invited to her cousin's home for an evening meal. I had been to Chris and Carole's once before. They had a HUGE German Shepherd and an even bigger Rottweiler. On my previous visit I witnessed them attacking the front door when someone rang the doorbell. There were scratch marks on that door more than 6 feet up. Needless to say, I was dreading that dinner! The evening of the meal came and as the wives were chatting in the kitchen, Chris and I were in the living room. I was sitting in a big armchair when Bella, the Rotty came in and sat down in front of me. I had always had an affinity with animals but knew next to nothing about dogs. Just about my only piece of information was to not look them in the eyes. No way was I going to look at Bella. She would attack for sure. After what seemed like a lifetime she sighed and walked away. During the meal we were all chatting away when a huge head appeared from under the table cloth and rested in my lap. It was Carole! Ha ha, kidding! It was Bella. Looking back now, 17 years later, and armed with around 10 years of dog related knowledge and having owned several dogs of my own, I know that when Bella sat 4 feet away from me, she was being respectful. When she appeared under the table she was trying to make friends with me. As I had ignored her she saw me as being ranked higher than her although we were still in her home. When I got my first dog, a German Shepherd, I craved information on how to read dogs' body language and on what they needed from me to be happy and healthy. 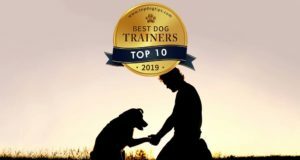 I studied every training technique I could find and read so many books that I was like a walking encyclopaedia on dogs behaviour. I crammed what should have been a lifetime of learning into a few short years. It wasn't until I had my first dog that I realized why I had been afraid. I had no idea of how to read dogs. I was quite a pessimistic kid. I was always looking for what MIGHT go wrong. With dogs I thought each unknown dog might attack me. That's scary! Please avoid having your kids go through the same thing. Teach them not to approach a dog that they don't know but also show them how to do it if they have to. If they see a dog with their owner they should not approach the dog without asking the owner first. If the owner gives permission, the approach should be calm and slow. Don't hug an unfamiliar dog. There is a lot more you can pass on to them but these easy points should simple for even small children to remember and understand. Previous articleDollars & Sense: Are Premium Dog Hair Clippers Worth It?